Whether you’re considering slate with copper flashing or something a little more modest, a new roof is a major investment that typically costs thousands of dollars. The materials themselves represent a relatively small portion of the bill. The bulk of what you’ll spend goes for the skilled labor involved. And that makes choosing an experienced pro the best way to protect your investment and ensure a leakproof job. Unfortunately, roofing is an easy-entry business that requires little more than a pickup, a ladder and some basic tools to get started. Search the web for “Roofing” only if you can’t get a recommendation from a neighbor, a friend or someone at your local lumberyard or home builder’s association. Gather at least two prospects, and make sure each has been in business at least five years — roofers who do shoddy work usually don’t last that long. Start your prospect check with availability. There’s no reason to waste time if they’re booked until next year. Get names and addresses of references, and drop any contractor who balks at providing them. Then do a drive-by inspection of a few recent jobs. Check that the spaces between individual shingle tabs, known as water gaps, line up laser-straight as they alternate shingle rows. Make sure that shingles are trimmed in a clean line along the valleys where they overlap the valley flashing. On roof ends, shingles should also be neatly trimmed so they align with the roof edge. Ragged lines mean slipshod work. Also look for neat, tar-free flashing at roof valleys and eaves. Was a designated foreman available to address your concerns during both the tear-off and installation of the new roof? (These jobs are sometimes done by different crews.) You want a point person for questions and concerns you have throughout the job. When a roofer comes by to look over your job and work up a price, note his appearance. Pride extends beyond the job site. If he isn’t clean enough to sit at your breakfast table, do you really want him working on your house? Then detail the full range of your expectations. Find out who will do the work and the foreman’s name. And get everything in writing. The questions to ask previous clients are good, it will give new clients an idea how the roofer does his job. It is also important that the roofer and client have a clear understanding about the project specially the cost of it so that there will be no hassle when the project already starts. I really like the idea of asking your family and friends about who is good to to hire. That way you can have someone else experiences to base your decisions off. This definitely is a problem. A lot of roofers are out of town and who knows if they are licensed. My husband and I need some work done on our roof, and I appreciate your tips for choosing a roofer. Checking the yellow pages is a good idea, for sure. We’ll be sure to call references and ask them the questions you suggested, as well. Decent post. I was looking for this sure information for quite a while.This post gives really quality data. thankyou for posting. There have been some really bad storms in my area lately and they have damaged my roof. It is good to know that I should check the company I am looking into hiring has been in business for at least five years. That does seem like a good thing for me to know because I want to get a good repair job done on my home. I like the tip you gave to contact a roofer’s references to see if they are reputable and worth hiring. My roof lost a few shingles to the wind last night, so I need to find a roofer to replace them before it rains. I will be sure to check their references before I decide to hire them. I really liked your tip to check with your roofer’s past clients so that you can know if they will be a good match for you. I have been thinking of getting sheet metal on my roof, and I want to make sure that the job gets done well. I will be sure to check the past clients of my roofer. Great! Thanks for sharing this informative post. Keep posting. I appreciate your suggestion to call references and ask if the project was completed under the budget. My husband and I need to have our roof replaced, but money is a little bit tight, so we have a very strict budget that we need to keep. When we’re talking to references, we’ll definitely make sure to see if the roofer stuck to the budget pretty closely or not. That’s critical for us, so that’ll be a huge factor in our final decision. We really need a new roof. Our asphalt shingles are practically falling off, so this is great to know. I like how you said that we should find someone who offers a good warranty. I’ll be sure to check for that! Also, make sure the company pulls a building permit, and when the job is finished, BEFORE you pay the contractor, check with the building inspector to make sure all required inspections have been done. I hired John Bean Roofing to do my roof and years later when I went to put my house on the market, I found out the building inspector has no record of the work being inspected, which is a snag in the sale of my house. I tried to reach out to the company, John Bean Roofing but they only have an answering service, you can’t speak to them directly and they haven’t returned my calls. I talk to new customers everyday in an attempt to maximize their insurance proceeds. I’ve found that the more I educate myself about homeowners insurance and the claims process, the more value they see in not only my service but also how accuracy gets the claim approved. There are many people out there wanting to make a quick dollar. Remember, a lower price doesn’t equate to better craftsmanship or better roofing solutions. Your roofing company shouldn’t have any issues with answering your questions, in fact I find educating them helps insurance agents retain loyal customers. I appreciate you talking about how to hire a great roofer. Last year, we had to replace our roof, and we did basically what you are suggesting here. We got referrals from friends/neighbors and got estimates from a few different places. We checked out recent jobs they did and we ended up getting a roofing company that we were very satisfied with. It was a bit stressful at first, but I think doing our homework paid off. Thanks for the info! 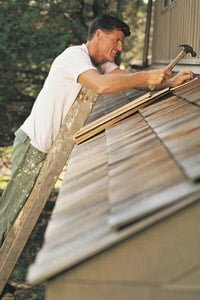 My family is looking to hire a roofer to fix up some leaks in our roof and this article really helped me see what I should be looking for. I would have never thought to ask for a warranty on the work provided but I will definitely do that when we find our guy. Thanks for helping me see how important the roofer actually is in the process! Roofing is a very large expense. I can see why it would be so important to make sure you have a great roofer! I like how you said to check with other people, and their experiences with their roofers. Thank you so much! This article was written 8 years ago, Yellow Pages are not the way to go, check online reviews, Yelp, Angies List, Google Reviews. Select a contractor with a RECENT reviews, sometimes a company is sold, new owner, same company name. Which should we replace first, the gutters or the roof? Underneath i believe it’s called the soffit n fascia, iit’s wood with tiny metal louvers that the painter painted when he painted the wood. Should I replace and update that too? We built the house in fall of 1988. I live in northeast Mississippi. I am a widow with no family or friends who can advise me. I live fundamentally on social security …. money is so limited …. but its urgent that I get a new roof. The present one is almost 30 years old, and I have a huge leak. What is the least expensive, most economical type of roofing material I should select? It doesn’t matter if it doesn’t last as many years as others. I’m 80+ years old. It will certainly outlive me. I really need your help with this and any advice on choosing a contractor or any pointers in this area. Thank you so very much. I hope this reaches you, because I feel you will try to help me if you see this message. Thanks again. I have a yankee gutter that leek back into the house over a window. What experience do a contractor need to repair this type of gutter? When asking a contractor for referrals, what company in their right mind would give a referral of a bad customer or a job that went wrong???????? Lets be honest, 5 times out of 10 they probably give an address of a relative or friend, and even if you do get a reference of a true customer – as an everyday “Joe” how would I the customer know the difference between a bad job and a good one? If I the customer don’t know the difference between a “3D shingle” and a “dimensional shingle” as the true term, how will I know the difference between anything else that I am looking at? I know someone that hired a roofer but isnt licensed. Right after a rain now the roof leaks in bathroom. What now? Are they insured? Have they worked locally, do they provide references? A few people have asked about flashings. Flashings ARE the most important part of a roof installation. A steep slope roof will almost never leak in the field of the roof, that is the vast majority of leaks in a shingled roof come from flashings. The roofing contrator should include flashing in the roof proposal. Make sure to get a written proposal with specific scope of work details, including materials to be used. Flashings should be comprised of aluminum or copper. The chimney is the most comprehensive flashing system and the contractor should have experience with this. Although Lone Mountain isn’t in AZ, we have been specializing in flat roofs (and only flat roofs) for over 25 years. We have a flat roof video available on our website (www.lonemountain.com) and on YouTube. However, you say nothing about flat roofs. Kinda difficult to check the work just driving by. I live in the Phoenix area, and I’ve seen “This Old House” refer, on houses on the East Coast, some kind of roll-out sheet for a seal AND Elastomeric AND a mesh fabric to hold it all together. However, in the heat of summer, I’m not sure about such a tight seal, even with under-eave venting and those “onion” vents that turn in the wind. Don’t you need it to breathe through the roof surface so, during the summer, heat doesn’t build up in space between the ceiling and the roof? So, what are the answers on flat roofs? When installing a new, flat roof, is it preferable to pitch it a little so water can run off more easily? I had a new roof put on my home last June. I was up pointing my chimney up with my husband and a noticed a funny looking shingle like it had been pulled out from the others. I went over to it and lifted it and underneath there was a hole no plywood of anything. I felt around and ot appeared to be hallow ina basketball size round areas. Also we walked on the roof and it felt really mushy in spots like we were going to fall through it. I’m sick to death knowing I paid almost $8,000 and my roof isn’t properly done. Should a new roof include new flashing around the chimney? I have leaks around both chimneys but he didn’t say anything about flashing when he gave me an estimate. I just assumed that was part of it. Everything they say in here is true.. check you Roofer carefully ; if you are gettinga speciality product like Metal shingles /or membarne EPDM roof for low slope roofs. Make sure your Roofer is certified to put the product in. Call the manufacturer, they know who is CERTIFIED in the craft. WWithout a certified installer you run the risk of your warranty being declared invalid if any ‘problems’ arise with the installation.